This article was written by guest author Dan Conover, who gave us a grand tour of North Charleston in January 2009. Dan is a writer, illustrator, and technologist who spent 20 years in the newspaper business, 14 of them as a reporter and editor for The Post and Courier of Charleston. For better or worse, the third-largest city in South Carolina has always defined itself in relation to its namesake: Where Charleston was genteel and sedate, North Charleston was bustling and blue-collar; if Charlestonians fretted excessively about planning and preservation, North Charleston's founding fathers (the city wasn't incorporated until 1972) embraced development with boom-town enthusiasm and little concern for the environment. The legacy of those attitudes is tangible. North Charleston now sprawls across 73 square miles, but much of its southern end, where the city's earliest growth took place, is run-down, shabby, and environmentally scarred. Yet we've noticed a trend, and it drew us to take another look. North Charleston has been investing in, attracting, and building a variety of environmentally friendly structures, businesses, developments, and initiatives. Much of this green activity seems to cluster around the city's blighted southern edge and the former navy base. Our first stop was East Montague Avenue. This little commercial area on the Cooper River side of the city's Park Circle district has undergone a remarkable renaissance in the past decade. The dreary vacant storefronts of the 1990s have been replaced with multiple bars, coffee shops, and restaurants, a theater company, a colorful garden store, and plenty of offices. An impressive streetscaping project ties it all together. As Joe Baldino, a former New Yorker who works at East Montague's South of Broadway Theatre Company, put it, this "Olde North Charleston" section of town reminds him of the East Village in Manhattan right before it became trendy. One downside to the popularity of the area is that longtime residents such as the Charleston Area Model Railroad Club are being pushed out of their spaces. EVO Pizza, our lunch destination, is one of its crown jewels. The restaurant serves gourmet pizza made with fresh ingredients harvested from local farms, offers handmade chocolates, and is famous for its selection of excellent beers. Our group had a great meal before heading less than a mile south to visit the source of one of EVO's most popular brands: COAST Brewing Company. COAST is a family business run by husband-and-wife team David Merritt and Jaime Tenney, who set up shop in 2007 in a building that used to be the navy's document storage center. The company uses organic ingredients, runs its equipment on locally produced biodiesel, and recycles its mash by selling it as animal feed to a Johns Island farmer. Demand for their beer is so strong that the waiting list for their kegs includes more than 20 bars and restaurants. COAST is located about half a mile from the shipyard of the navy base. One building there stands out: 10 Storehouse Row, a former industrial site that has found new life as the home to the American College of the Building Arts, a small diner, an event space, and about a dozen small, environmentally low-impact businesses – designers, multimedia producers, and artists. It's part of Noisette, a public-private partnership with a grand plan to revitalize roughly 3,000 acres in and around the former navy base. Even as home values drop around the country, property values in the aggressively green Noisette area grew by 32 percent in 2008. 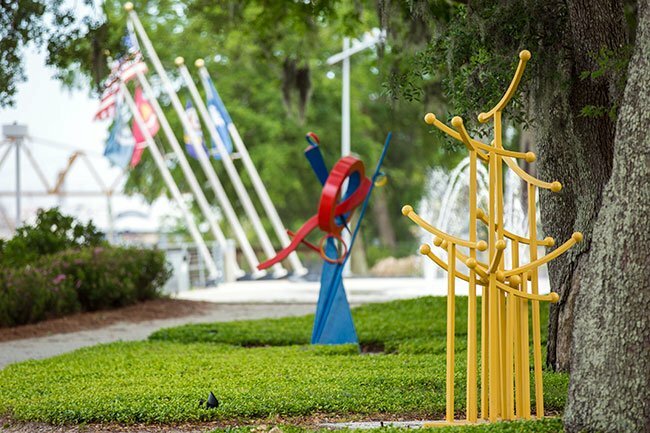 One reason is the city's new Riverfront Park, a little known gem with world-class sculpture, an amphitheater, and sweeping views of the Cooper River. Not everything is upbeat, of course. Ninety-seven percent of the students at nearby North Charleston Elementary School live below the poverty line. Yet the school itself is attractive, modern, and extremely green. It was built using recycled parts of the building it replaced. It freezes ice during low-demand hours to provide cooling. Natural light keeps everything bright. Low-flow fixtures and native landscaping reduce water usage. Teachers and students are actively involved in sorting and recycling almost everything the school consumes. It's the first school in the state to receive certification by the US Green Building Council's Leadership in Energy and Environmental Design (LEED) program. The elementary school stands as an example of the city's paradox: Though North Charleston remains one of the poorest places in the Lowcountry, its willingness to embrace new ideas gives it a leg up on some of its neighbors when it comes to sustainable living. Times are tough, but they might be looking up for North Charleston.